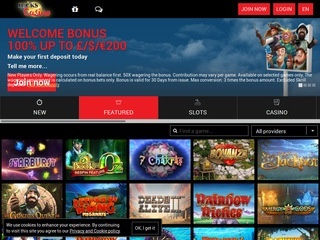 Lucks Casino will then reward you with a bonus (Welcome Bonus is for new players only). The terms and conditions of the bonuses vary between different casinos and might also change over time and between different countries, so it is important to compare the different offers and read the T&C for Lucks Casino before signing up. Licensed by the strictest of regulatory bodies – the UK Gambling Commission and Malta Gaming Authority – right off the bat promises a fair and trustworthy treatment at this online casino. 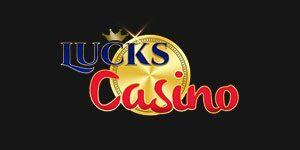 Lucks Casino was launched in 2012 by a grand name in the industry – ProgressPlay Limited Casinos. This both instant play and mobile casino offers supreme mobile gaming service and is compatible with both Android and iOS operating systems. Utilising the one-click system, the website is user-friendly and generally very easily navigated when you access to it for the first time. Lucks Casino is supplied by a trio of the biggest names of iGaming – Microgaming, NetEnt and NextGen Gaming, catering for diversity and breadth of offering. There is wide diapason of slots, table games and live casino games, as well as a video poker section. A luxurious VIP games collection is available for the casino’s loyal customers. Slots naturally take up the biggest part of the online casino. They are additionally part of the majority of the casino’s promo deals regularly taking part and being renewed almost every week. Spinning on your favourite slots can get you a plentiful of free spins as well as some nifty cash prizes, so get spinning! The portfolio encompasses the biggest titles created by the three manufactures, as well as the new additions on the market. Therefore, here you can enjoy Finn and the Swirly Spin™, the potent Renegades slot, the Blood Queen slot, Samurai Split, Twin Spin Deluxe, Foxin’s Wins and Rainbow Riches, among many others. Fans of virtual table games, regardless of caliber and expertise can enjoy copious amounts of classic casino games like Baccarat, Blackjack, Poker and Roulette, but also an abundance of their contemporary variants. Have a whirl with 3D European Roulette, Blackjack Single Deck Touch, Multi Hand Classic Blackjack Gold, and Blackjack Pro Monte Carlo Single Hand among others. A total of 21 table games are currently offered, so that should satisfy your table game thirst. However, Lucks Casino does not stop there, and the repertoire is likely to expand in the near future. More titles are at hand if you are a VIP client at Lucks Casino, and you can revel in even more bonuses than other customers! Other games department is decent and offers a variety of video poker titles for all passionate lovers of this traditional and original casino game. The repertoire includes fan favourites like Aces & Eights, Deuces Wild, Double Bonus Poker and Louisiana Double. The Live Dealer section is easily spotted right from the main taskbar on the homepage on your right-hand side when you are using desktop version. Clicking on the tab will lead you to the inviting page of about 20 supremely entertaining live games dealt just for you by real croupiers in real time. Using the latest webcam technology and broadcast from a professional casino studio, Live Casino department at Lucks Casino prides itself in quality HD service. Among the selection you will find Live Baccarat, Live Blackjack and Live Roulette, their variants and exclusive VIP editions of the games. So long, slow and inefficient banking! At Lucks Casino this tiresome business is handled quickly and smoothly, and you can choose a variety of methods to do it with. When depositing, you can utilize more than 15 means for transferring cash, among which are popular credit and debit cards, ewallets like Neteller, Discover, Paysafe Card, JCB mobile wallet (if you are using mobile credit, you will not have to enter your banking details) and others, as well as the pay by phone option. To withdraw cash, you can also use bank wire transfers and cheques, minus Discover and JSB. The accepted tender includes British pounds sterling, Euros and US dollars. Lucks Casino sets some really nice withdrawal limits – per week being 1,500, and the monthly boundary set at 3,000 in you respective currency. For any enquiries that you think other players might have had before you, we strongly recommend that you should check out the comprehensive FAQ section on the support page, as you are more than likely to find the answer there. In addition, Lucks Casino offers efficient and helpful advice every day of the week; either via email or using the handy Live Chat feature. Live Chat support is at your disposal 7 days a week, and the email address you need if you prefer written communication is [email protected] Lastly, you can opt for filling out the online enquiry form directly on the website. As you could have noticed by now, Lucks Casino is big on VIPs and cherishes your loyalty, so even in this segment, loyal clients are rewarded additionally. A special VIP support team is there to help you with anything you might need assistance with, provided that you keep coming back to Lucks Casino.